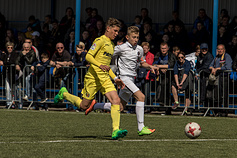 © Archive of FC "Almaz-Antey"
On 14 May 2017 the Second International Football Tournament for Lev Burchalkin Cup held in Saint-Petersburg for the second year in a row ended in victory of the Spanish team «Villarreal». FC «Partizan» (Serbia) won silver while FC «Almaz-Antey» (Saint-Petersburg) has become the best from all the Russian clubs taking the third place. This year young football players not older than thirteen years old have come to compete for L.D. Burchalkin Cup. These were players from the famous Russian and European clubs: «Villarreal» (Spain), «VITORIA» (Portugal), «МТК» (Hungary), «Partizan» (Serbia), «CSKA» (Moscow), «Lokomotiv» (Moscow), «Zenit» (St. Petersburg), «Almaz-Antey» (St. Petersburg). We remind you the tournament was held for the first time in 2016 with the support of the Concern “Almaz-Antey” jointly with the Football Federation of St. Petersburg in memory of the legendary forward of FC Zenit who began his football career in the team of Sports Club “Bolshevik” (now FC “Almaz-Antey”). The main purpose of the tournament is to develop the international football movement and support children’s and young people’s sports in Russia. II International football tournament for Lev Burchalkin Cup was held on 12-14 May on football stadium “Almaz-Antey” located on the territory of Obukhovsky sports complex. According to the drawing held in Saint Petersburg the first match day was opened by the game between “Almaz-Antey” and “MTK” teams. The hosts of the tournament won on penalties in an opening match (with the score 7:6) and the team players were given a pass to compete for prizes places in tournament total. The same can’t be said for the other Russian teams who in the first playing day lost the victory to their foreign competitors and dropped out of the fight for the medals: CSKA – «Villarreal» (1:3), «Zenit» - «VITORIA» (1:0), «Lokomotiv» - «Partizan» (0:4). The second playing day shaped well for Moscow teams. «Lokomotiv» made amends to its fans by beating the Hungarian MTK (1:0), and CSKA didn’t give any chances of winning to «Zenit» (2:0). «Almaz-Antey» from St. Petersburg was also unable to break a masterful play of «Partizan» (0:3) and dropped out of the fight for the gold of the Championship. Intense and almost equal fighting on the playing field was going between the Spanish «Villarreal» and the Portuguese «VITORIA». The acknowledged grandees of the world football failed to find out who nowadays was the strongest team on the playing ground during the regulation time. The winner was found by a series of penalty kicks. And the luck turned around to the championship’s much fancied team – the Spanish club «Villarreal», leaving «VITORIA» just with a chance of winning bronze medal (regulation time score: 0:0, on penalties (4:2). 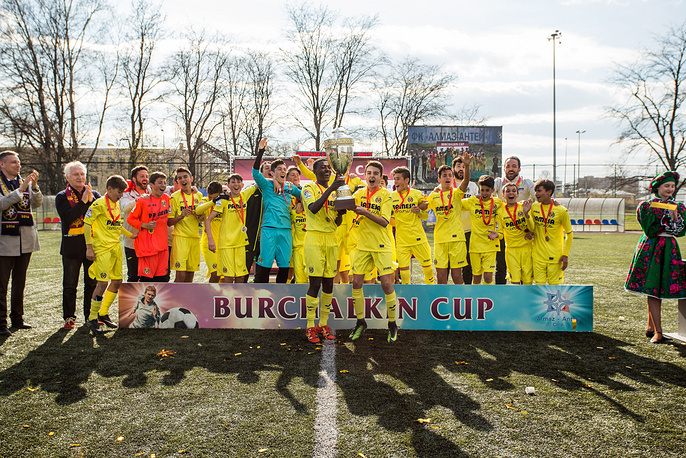 A closing day of the II International Youth Football Tournament for Lev Burchalkin Cup has become a bright highlight of this amazing sport holiday. Summing up the tournament’s results, Mikhail Podvyaznikov, Deputy Director General of the Concern, Director of the North West Regional Center of the Aerospace Defense Concern “Almaz- Antey”, President of FC “Almaz-Antey”, said: «On behalf of the tournament’s organizers I thank sincerely all the participants of these competitions. You gave us wonderful moments of an amazing football! I wish success to all the young footballers and we’re waiting for you again the next year!». Boris Vakhrushev, First Vice President of the Interregional Association of Football Federations “Severo-Zapad” (North West), on behalf of the entire football community and the whole city thanked all the participants and tournament’s organizers: «This tournament has become a remarkable present for the Russian football 105th anniversary and tribute to the memory of St. Petersburg’s great footballer Lev Burchalkin. Let this tournament live and make us happy for a long time!». A closing day of the tournament attracted a strong interest of the audience and all the stands of the “Almaz-Antey” stadium were overcrowded. The fans gave their favourites quite strong support and young footballers were playing like big men – laid themselves out sparing no pains trying to do their best in their attempts to score a goal to the competitors’ goalposts. After all, the reputation of their own team was at stake! The victory of the amateur club «Almaz-Antey» over «VITORIA» has become number one event of the tournament. The hosts of the field managed to score a goal into the Portuguese goalposts during the first minutes of the first half. And it appears that the footballers of «VITORIA» team failed to rebound from it. As the result, the bewinged “Almaz-Antey” players retained the superiority they’d got and defended their bronze medal of the Championship (1:0). 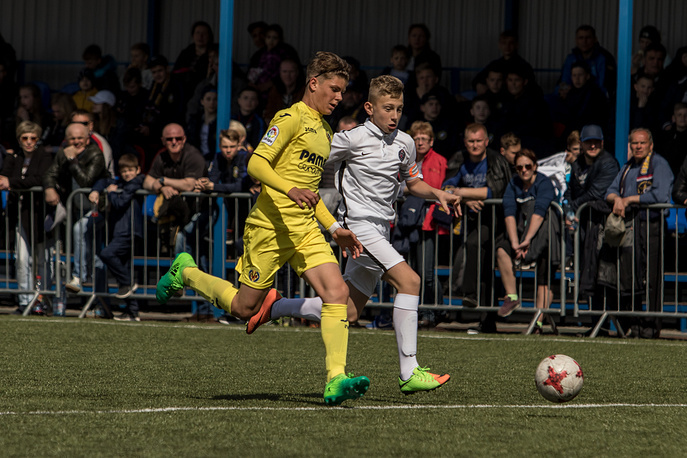 An impressive score in the gold medal match between «Villarreal» and «Partizan» didn’t give up the Serbs any hope for the victory (5:0). Five goals which the Spanish scored in the first half discouraged the competitor and didn’t even leave them a chance of consolation goal. As the result, the Spanish «Villarreal» won Lev Burchalkin Cup for the second year in a row, the Serbian «Partizan» became silver winner, and «Almaz-Antey» took bronze. For the «will-to-win spirit» shown CSKA team come in 5th in the tournament got a special prize from the tournament’s media partner “Saint-Petersburg Journal” publishing house. CSKA player Matvei Lukin was marked as the best half-back of the tournament and awarded a special cup given by the son of the legendary forward of FC “Zenit” Lev Burchalkin. Traditionally during the run of the tournament the organizers prepare for all the participating teams not only sport but also cultural program. The guests were shown the places of interest of the Northern Capital, had some excursions including the quest (adventure game) through the territory of the Peter and Paul Fortress and the boat tour in the Neva river’s aquatorium. After the grand closing ceremony a festive dinner was prepared for the teams where young football players and coaches had a chance to mingle in an informal setting, discuss the tournament’s results and further plans for potential cooperation. Contacts for mass media: tel. : 8 (812) 363-98-36, 8 (985) 774-96-74, e-mail:press@dsszrc.ru.